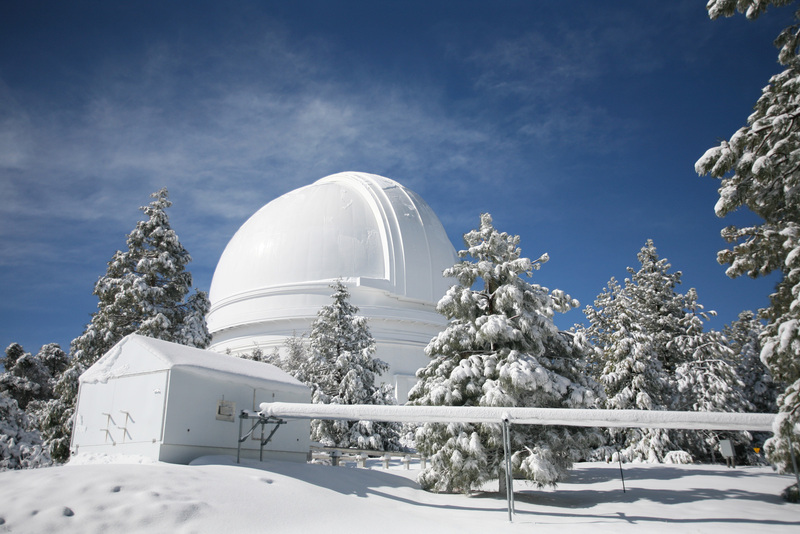 The 18-inch Schmidt and the Palomar Testbed Interferometer were two research telescopes at Palomar Observatory. Although these telescopes are no longer active, their scientific contributions continue to be relevant today as they pioneered several areas of current astronomical research. The 18-inch Schmidt telescope was the first instrument at Palomar Observatory and was the only operational telescope on site between 1936 and 1949. Beginning in the late 1940s, this instrument was used in conjunction with the newly-built 48-inch Schmidt (later to become the Samuel Oschin Telescope) to provide targets for the 200-inch Hale Telescope. Between the 1970s and 90s, the 18-inch proved to be a workhorse in the systematic search for minor bodies in the Solar System. 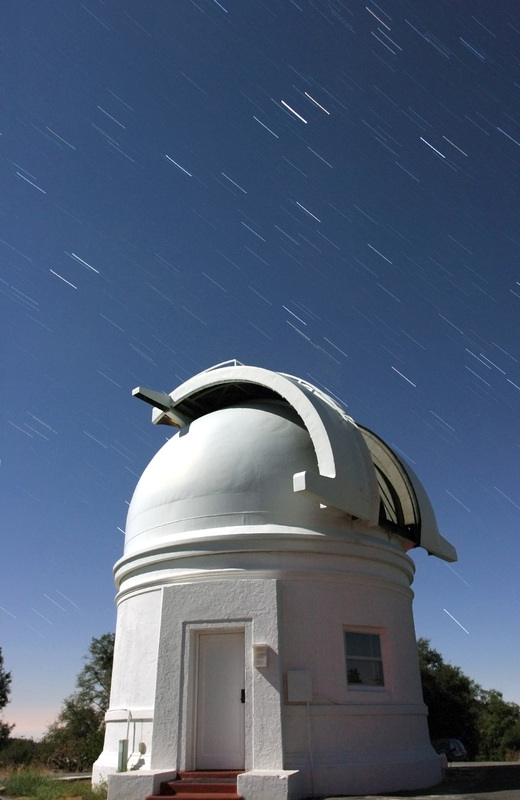 The telescope was decommissioned in the mid-1990s and was removed from its dome to make room for a robotic atmospheric turbulence monitoring system in 2006. Thanks to the generosity of the Eleanor and Ronald Helin Trust, the 18-inch Schmidt was re-assembled in 2013 and is currently on display as part of the Eleanor Helin Commemorative Exhibit at the Greenway Visitor Center. The Schmidt telescope is actually a camera with photographic film placed at the focal plane inside the tube. The diameters of the mirror and correcting plate are 24 inches (61 cm) and 18 inches (46 cm), respectively. The focal length is 36 inches (92 cm), producing a focal ratio of f/2. The film covered an area of the sky 8.75 degrees in diameter, roughly the size of 17 full moons. To photograph with the 18-inch Schmidt, the observer would first punch 6 ¼-inch (15.5-cm) circles of unexposed film with a film cutter—affectionately known as the “cookie cutter”—in the telescope's darkroom. Then, the observer would place the film circle inside a film holder that applied the appropriate spherical curvature to allow for the entire film to stay in focus during exposure. The tightly-closed holder would then be positioned inside the telescope tube through a small door on its side. After removal of the holder’s cap, the film was ready for exposure. Handwritten logbooks were used during observing runs to record date, time, sky coordinates, and any remarks for each exposure. Custom-built microscopes were used to scan films exposed with the 18-inch telescope for asteroids and comets. Unlike the Hale and Samuel Oschin telescopes, the 18-inch was never upgraded to use electronic detectors (CCDs). The construction of the 18-inch Schmidt in 1936 was advocated by Caltech astronomer Fritz Zwicky, who needed an instrument that could efficiently photograph large areas of the sky to search for exploding stars known as supernovae. 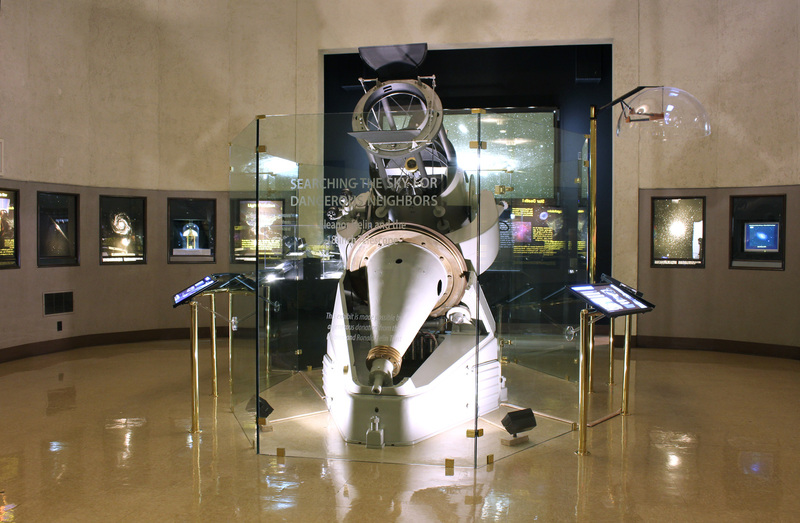 The Schmidt telescope was funded from the original Rockefeller grant for the construction of the 200-inch. It was designed by telescope maker Russell W. Porter and engineered at Caltech by John Anderson, Sinclair Smith, and Albert Brower based on a photographic camera invented in 1930 by optician Bernhard Schmidt. 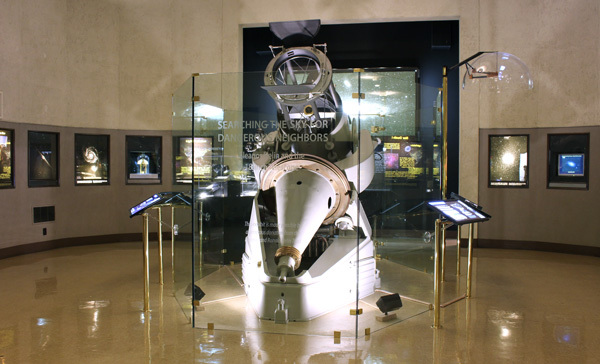 The optics were figured at the Caltech optical shop, while the tube and mounting were manufactured at the Caltech instrument shop. The telescope was finished within a year. 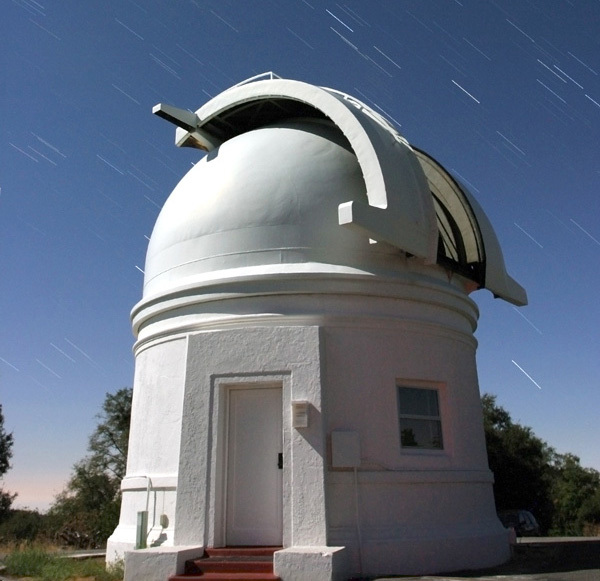 The 18-inch Schmidt saw first light on September 5, 1936 and was Palomar's only operational telescope until 1949. Fritz Zwicky found his first supernova with the 18-inch telescope in March 1937, followed by a couple of notable examples later that year. He and Josef J. Johnson discovered a total of 19 supernovae until World War II interrupted the search program in January 1942. This work yielded two results of far-reaching consequences for the understanding of stellar populations and evolution—namely, that there are different types of supernovae and that they are caused by “a stupendous nuclear fusion chain reaction.” Although Zwicky and Walter Baade had correctly speculated on the nature of these objects in the early 1930s, their theory was confirmed only after follow-up observations of the 18-inch Schmidt supernovae with the 60- and 100-inch telescopes at Mt. 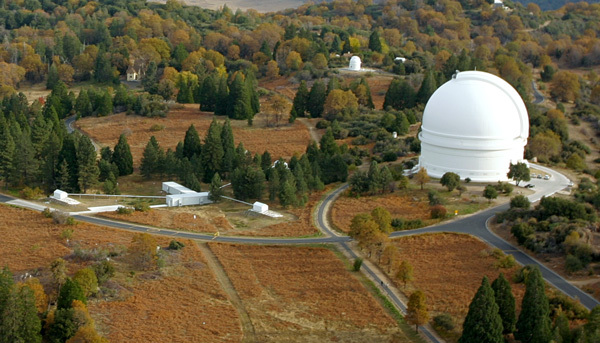 Wilson—there were no telescopes capable of doing so at Palomar yet. Given the success of the 18-inch Schmidt during the 1930s, resources to build a larger Schmidt were committed in 1937. Beginning in the late 1940s, both instruments were used to provide targets for the 200-inch Hale Telescope. 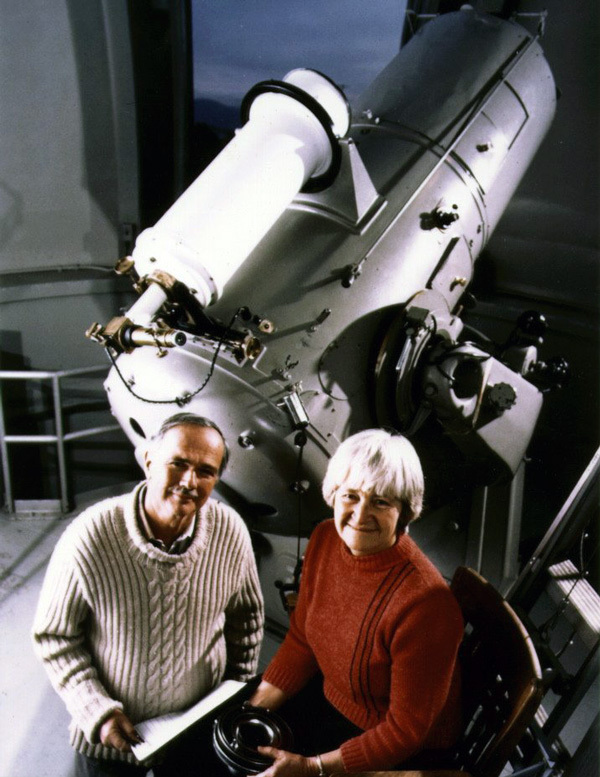 Between the 1970s and 1990s Eleanor Helin, Eugene and Carolyn Shoemaker, David Levy, and others photographed and mapped hundreds of asteroids and dozens of comets, including near-Earth objects, using the 18-inch telescope as the main instrument for the Palomar Planet-Crossing Asteroid Survey (PCAS, 1973 – 1995) and the Palomar Asteroid and Comet Survey (PACS, 1982 – 1994). In its long and productive life, this instrument has yielded many discoveries, including a large number of asteroids and nearly 50 comets. This work on minor bodies painted a picture of a dynamic Solar System where collisions between bodies, even asteroidal impacts with Earth, are not just a remote possibility. 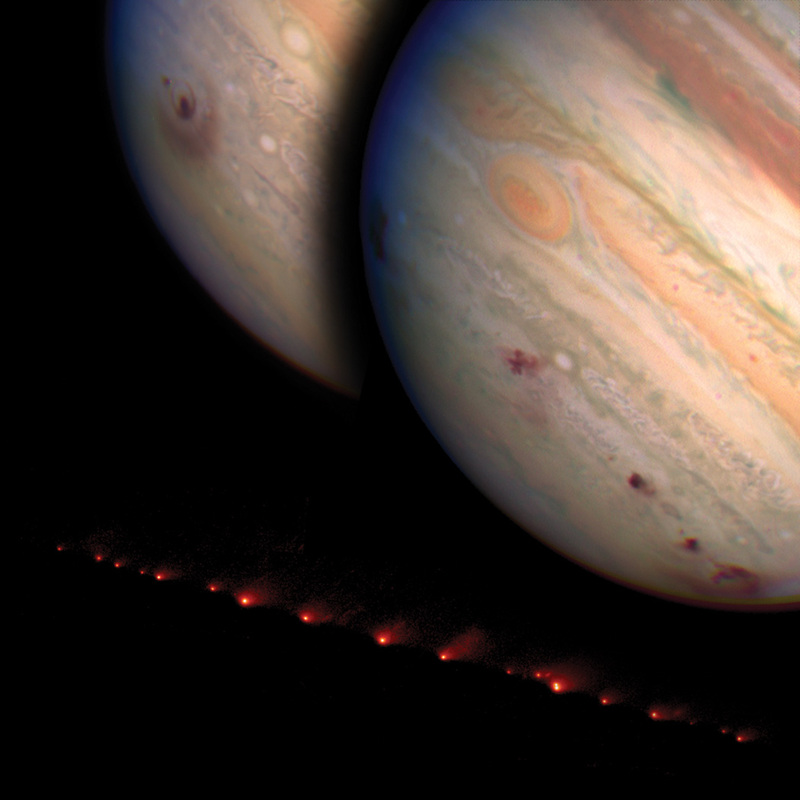 In fact, the famous Comet Shoemaker-Levy 9 was discovered with the 18-inch in 1993. The fragmented comet collided with Jupiter a year later in a spectacular astronomical show that captured the world’s attention. These search programs were the predecesors of modern ground- and space-based surveys that map small Solar System objects in Earth's vicinity and may one day warn, even help prevent, an asteroidal collision with catastrophic consequences for humanity. This topic is explored further in Searching the Sky for Dangerous Neighbors, an exhibit at the Greenway Visitor Center on Eleanor Helin and her work with the 18-inch Schmidt. 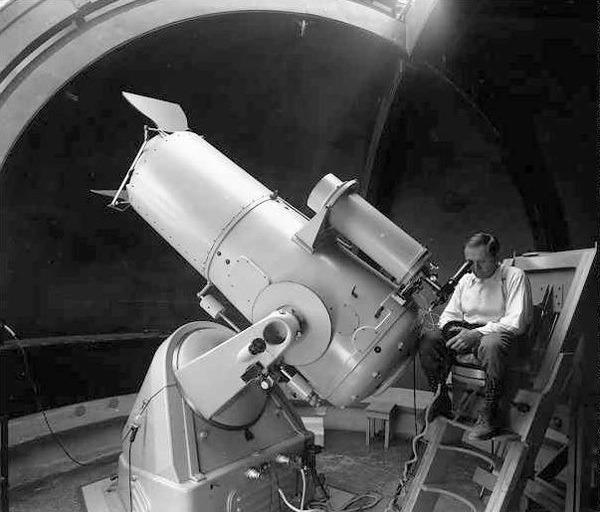 In 1935, $25,000 of the Rockefeller grant were set aside to fund the building of the 18-inch Schmidt telescope. The telescope and its dome were finished within a year. 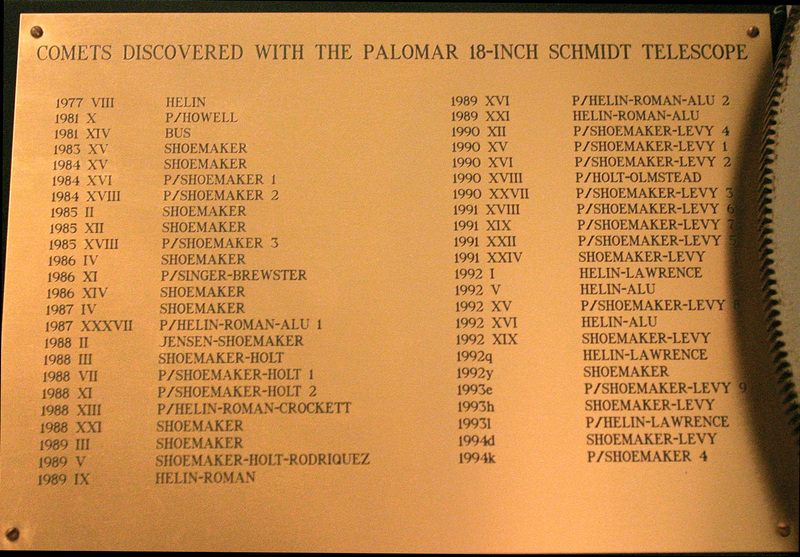 The 18-inch Schmidt became Palomar's first research telescope when Fritz Zwicky put it in operation the night of September 5, 1936. Fritz Zwicky began immediately using the 18-inch Schmidt for his supernova and galaxy clustering studies. He and Josef J. Johnson discovered a total of 19 supernovae until World War II interrupted the search program in January 1942. Fritz Zwicky continued his research on the clustering of galaxies during the 1950s. Between 1961 and 1968, he published A New Catalogue of Bright Galaxies and Clusters of Galaxies in 6 volumes containing about 10,000 rich clusters of galaxies and 35,000 galaxies. Fritz Zwicky and Emil Herzog used the 18-inch Schmidt to conduct a systematic search for novae. The three-month search yielded three novae in the same field in Scorpius. The supernova search program with the 18-inch Schmidt was resumed in 1954 by Paul Wild, later joined by H. S. Gates, Fritz Zwicky and others. The program continued in conjunction with the larger Schmidt starting in 1959 and ended in late 1975. The Palomar Planet-Crossing Asteroid Survey (PCAS) was a 23-year-long photo­graphic program led by Eleanor Helin and Eugene Shoe­maker (prior to 1982) dedi­cated to the detection of near-Earth objects (NEOs). The search yielded 65 mapped NEOs. The Palomar Asteroid and Comet Survey (PACS), led by Eugene and Carolyn Shoe­maker, searched for asteroids that could cross Earth's orbit and potentially collide with it. This survey yielded 42 of these objects. The famous comet Shoemaker-Levy 9 was discovered with the 18-inch in 1993. The fragmented comet collided with Jupiter a year later in a spec­tacular astro­nomical show that captured the world's attention. Thanks to the genero­sity of the Eleanor and Ronald Helin Trust, the 18-inch Schmidt was put on public display at the Observatory's Visitor Center. 18-inch Schmidt telescope graphical timeline ( go to expanded timeline). Time starts in 1920 and flows to the right; use the scroll bar to reach the 2010s. Each column corresponds to a decade, vertical lines indicate years. Darker background shows when the telescope was operational. Each event is shown as a bar whose width indicates time span. Hovering with mouse over an event will bring up a short explanation. Hint: use the keyboard shortcuts (no shift) control/command + to zoom in, control/command − to zoom out, and control/command 0 to reset. The Palomar Testbed Interferometer (PTI) was a near-infrared, long-baseline stellar interferometer of three 15 ¾-inch (0.4-meter) telescopes that provided a combined baseline up to 360 feet (110 meters). The large distance between the telescopes allowed for high angular resolution measurements to be made. The light was directed through pipes to the central beam combining building where it was analyzed. 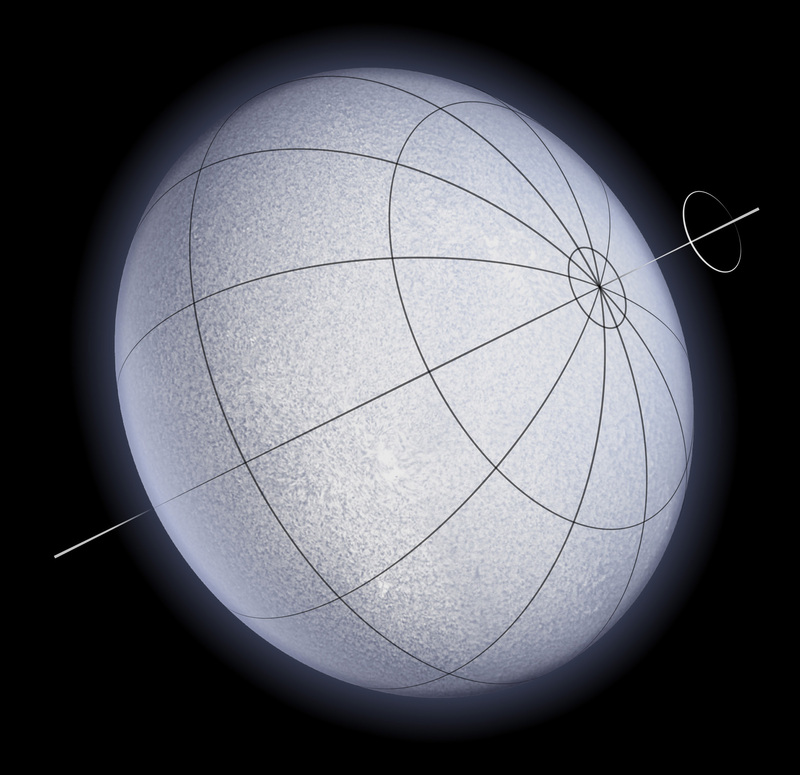 PTI was used to measure the sizes of stars, their orbits, and their environments. First fringes were obtained in July 1995 and it was operated until December 2008. 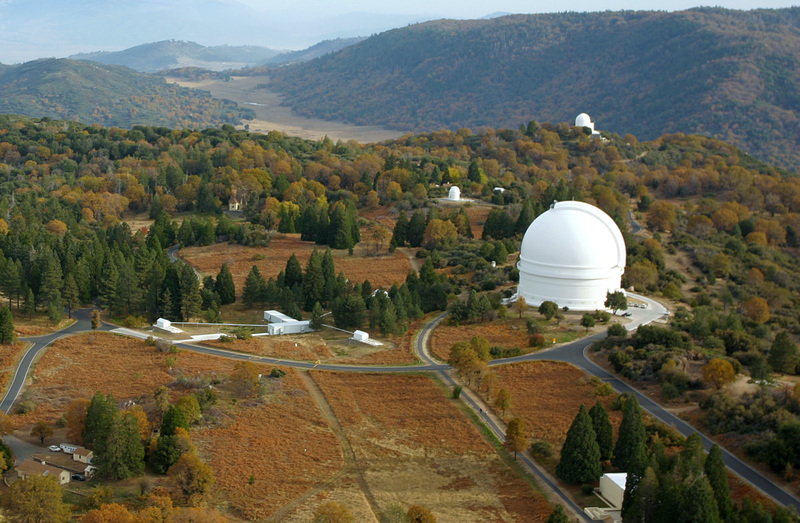 During its lifetime, PTI was the highest angular resolution telescope at Palomar Observatory. PTI's development and early operations were carried out by the Jet Propulsion Laboratory (JPL) with funding from NASA under its TOPS, ASEPS, and Origins programs, with additional funding from the JPL Director's Discretionary Fund and the JPL Director's Research and Development Fund. Subsequent science operations were carried out by NASA Exoplanet Science Institute (NExScI) with funding from NASA, the Palomar High-precision Astrometric Search for Exoplanet Systems (PHASES) project, and the Infrared Processing and Analysis Center (IPAC). PTI had three 40 cm telescopes that could be combined pair-wise to provide baselines between 60 and 110 m. The interferometer actively tracked the white-light fringe at H and K bands, using laser-monitored active delay lines, with angle tracking implemented at R band. The instrument was highly automated, allowing for a high observing cadence. Many of the technical approaches developed at PTI were applied at the NASA Keck Interferometer. Most PTI science observations used a single beam on the long baseline to measure fringe visibility. However, PTI also included the capability for dual-beam narrow-angle astrometry, and was used for demonstration of this technique. In addition, PTI also carried out the PHASES single-beam very narrow-angle astrometry program. PTI was used to measure the sizes of dwarf, giant, and supergiant stars, the sizes of emissive regions around young stellar objects, and binary and multiple star orbits, both from visibility measurements and PHASES astrometry. It was the first interferometer to have directly measured the diameter changes of a Cepheid variable star, and to have directly measured the rotational oblateness of a rapidly rotating star.